I love a good coincidence story, like a lot of people. This American Life (aka the greatest podcast in the world, if you aren’t already well acquainted what on earth are you doing reading this and not on their website downloading EVERYTHING?!) recently did an episode on coincidences and it was so fascinating, I found myself attempting to relay each story to Andy and failing at doing them justice. Because that’s the thing with coincidences; you always think yours is the best. You feel like you have something bizarrely wonderful and ‘small worldly’ happen but upon retelling it to others, barely manage to muster any interest. That was my experience last week when I had, what I thought was, an incredible small world story. I mentioned, absentmindedly, to my friend at work that this time last year I was in New York City seeing Matilda the musical. To which she replied “I was in New York this time last year as well! But we saw Jersey Boys and Aladdin“. 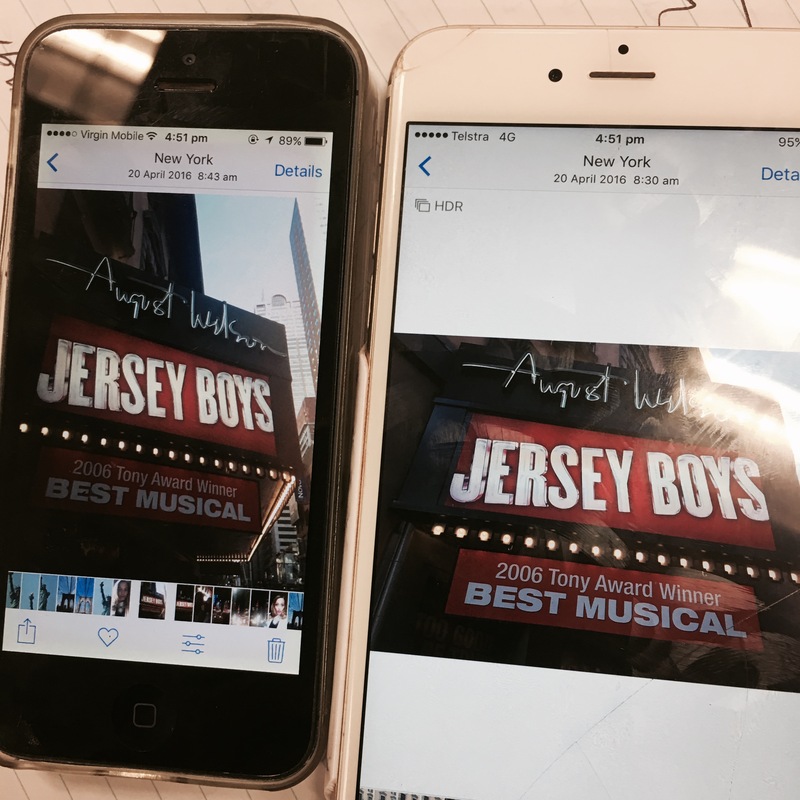 Long story short, it turns out we both saw Jersey Boys in NYC, on the same night, in the same theatre, both with our parents and partner AND scrolling back through our phones, we both took almost exactly the same photo just 13 minutes apart…!!! At the time, neither of us worked at our current organisation. I wasn’t even sure I’d end up back in Melbourne. Doesn’t it seem amazing that a year after seeing the same show in NYC, we are sitting on the opposite side of the world at adjacent desks?! Doesn’t it?! Probably not. Because it’s my coincidence story, not yours. I want to hear yours and I’ll let you know how it rates to an outsider. Go on! This entry was posted in Misc, Social Commentary and tagged Coincidences, Musical, NYC. Bookmark the permalink. 12 Responses to What’s your best coincidence story? Your story is a pretty amazing coincidence Rebecca. When I was on the Greek Island of Ios back in the 80’s I met a guy, Neil, from South Africa who was a friend of my then Canadian boyfriend. In 1996 when I first moved to Ulladulla I kept seeing this guy around town who looked like Neil but thought that it couldn’t possibly be him. Then I found out that he owned a cafe called Neil’s Cafe so I approached him & asked if he’d ever been to Ios. He then recognised me & we were amazed that we both lived in Ulladulla, Neil had married an Aussie girl. After talking we found out that we both had a son in the same class at the same school who were friends. I have a few mind-blowing coincidence stories about bumping into people you know in out-of-the-way places. Yes that is a great coincidence. I think mine is when travelling from Wodonga to Melbourne the car broke down. We were lucky to be right near a service station. On the wall were numbers for various mechanics. The ex chose one number. After a lengthy conversation the mechanic said he could tow the car to his garage. He asked where we were heading to. He had a person at his garage who lived off the same main road I did not even five minutes out of his way. He was willing to drop us off free of charge. The car was going to take a few days to fix. These sorts of things happen to me quite often. Even this being your topic could be classed as a coincidence for me. Over the last week I’ve had this same discussion with several people. Oh really? How funny! I thought of anther good one: two weeks after we moved into our house someone moved out and we had to find a new housemate, we interviewed a bunch of people from FlatmateFinder.com and picked a girl originally from Cairns who had just moved back to Aus after living in London. A month later we went to the footy and she brought a girl she met in Turkey, who turned out to be the daughter of my maths teacher and house coordinator from high school. What are the chances?! Such a small world! I have posted about coincidences before because weird things like that happen to me too! The best one I can think of was when one of my friends asked me to go for lunch and cocktails to meet up with her cousin who was visiting from England, her cousin had brought a friend up with her… who turned out to be my cousin! Wow! That is nuts. Reminds me of that Vampire Weekend song that goes ‘me and my cousins and you and your cousins…’ I think it’s called Cousins haha. Going back to find your post now! OK… so the son (Shane) of very good friends of my parents moves to Kalgoorlie late last year with his family (Wife Bonnie and 2 sons) from South Africa. We were asked to be their hosts in a new town be came really good friends with them. This year we attended the Goldfields Children’s Charity Ball and who should be there but Bonnie and Shane. This was a bit of a coincidence in itself as tickets are extremely hard to come by and I had only just that day said to Lauren that we should get them tickets next year. So the night progressed and many drinks were had and we took the obligatory selfie on the dance floor and, of course, because certain things are expected nowadays the photo was uploaded and tagged. The family saw it. They liked it. Friends saw it and they liked it. Now this is where is gets freaky… Some other friends of mine who live in London work for a maintenance company (or something like that). Alexis was talking to one of her co-workers, a south African guy, about where they were each from. Alexis said that she was from Kalgoorlie in Australia and this other guys exclaims that a good friend of his just moved there. Then proceeded to show her a photo that popped up in his news feed of yours truly, Lauren, Bonnie and Shane. Hahaha you’ve been Kalgoorlied! Social media is great like that. When we were in Chile the girl from the couple we were travelling with was like ‘check out my friend and his mates in these hilarious Christmas print suits on a London pub crawl’ and showed me the photo of them on Facebook. I knew one of the other dudes in the photo. So for my 18th birthday Marc took me to Hong Kong Disneyland, and when we were there I ran into a girl from primary school whose name was also Jess and shared the same birthday. Pretty weird! Then we ran into her the next day too, which could easily happen in Perth but is quite extraordinary in a city as huge as Hong Kong! Love it! The amount of people you run into travelling is so bizarre, the world really is tiny.